Ok, I’ve got a lot of bird feeders. I’ll readily admit that. I like to joke that some women collect shoes; I collect bird feeders. I realize that most people don’t have, or necessarily want, as many feeders as I’ve got, but if you’ve got more than one or two, I think my experience with arranging them can still be helpful to you. There is a surprising amount of thought that goes into deciding where to put a bird feeder. From a human perspective, you want to locate them in spots where you can see them easily from your house or porch or wherever you like to observe birds. And you want the feeders in spots where they won’t interfere with other activities in your yard or create a mess. 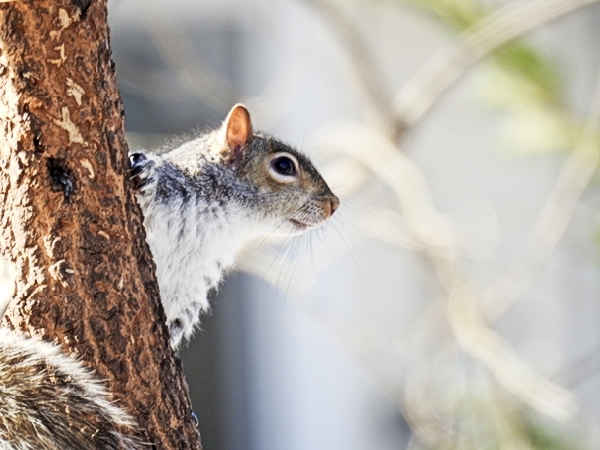 From a predator deterring perspective, you want them out of reach of jumping, climbing, dangling and reaching squirrels. And you want to put them a relatively short flight from cover so birds have a space to retreat if the neighborhood hawk or cat comes to visit. But you also need to think about it from a bird’s perspective. Cornell’s All About Birds describes birds eating at feeders as being not the peaceful idyllic scene you might envision but being more like fight club. It makes sense when you think about it. Even when there is plenty of food for all, birds by nature want to be sure that they get the nourishment they need and will jockey for one of the limited spots at the feeder. After all, they never know when they will suddenly be interrupted and have to suddenly leave the banquet due to human activity, loud noises, predators or the arrival of other more dominant birds. There is a dominance hierarchy going on at any feeder. Within a species there are usually birds that are more dominant. This can vary by species but might be determined by things like gender or relative size or maturity. And then there is dominance of one species over another, decided by things like size or aggressiveness. (Cornell’s Feederwatch currently has an interesting citizen science project to track interspecies dominance hierarchies.) 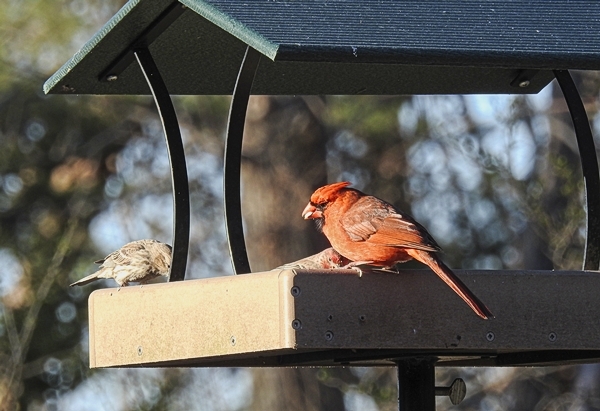 When two birds show up at the same feeder, one bird may back off in deference to the other. Or one bird might invade the other’s space with their body or their beak to get the other to give way. Most of the time, the noticeable physical bickering and fighting we see at feeders is within a species, but anyone who has watched a European Starling move around a feeder, knows that there can be interspecies aggression too. A lot of this feeder friction is something we humans can do nothing about, but we can set up our feeders to make things run a little smoother. Here is how I arrange things in my yard. 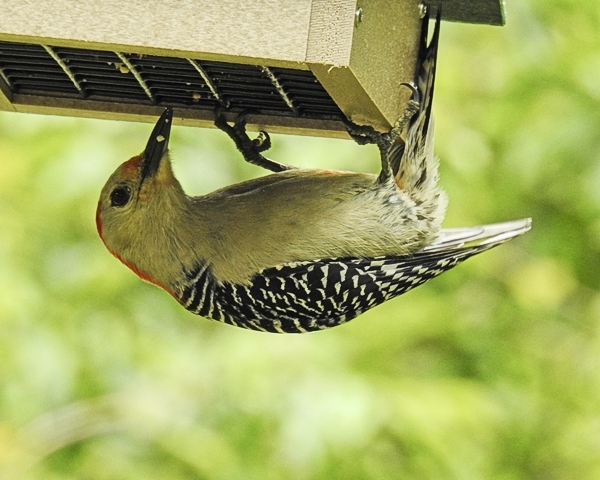 1) I have five Birds Choice upside-down suet feeders. Three are clustered on one dual shepherd’s hook pole in the back yard and two are on another dual shepherd’s hook pole in the front yard. With the exception of starlings, most birds using this type of feeder can coexist fairly peacefully, but some of them are a little shy about eating right next to flocks of busy, sometimes bickering birds. So my suet feeder clusters are thirteen feet and twenty-four feet from other feeders. 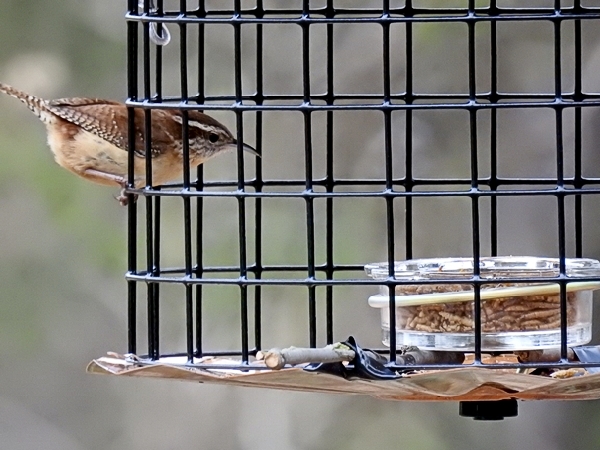 Even when other feeders are full of very active Red-Winged Blackbirds or House Finches or American Goldfinches, the woodpeckers and wrens and nuthatches and other birds can go to one of the suet feeders to eat in peace. Having some suet feeders in the front yard and some in the back lets some Downy Woodpeckers use the front feeder and others use the back, limiting some intra-species territorial disputes. 2) There are a LOT of American Goldfinches in my yard each day. Most other feeder birds are bigger and more dominant than them (except in some cases when they greatly outnumber the other species.) 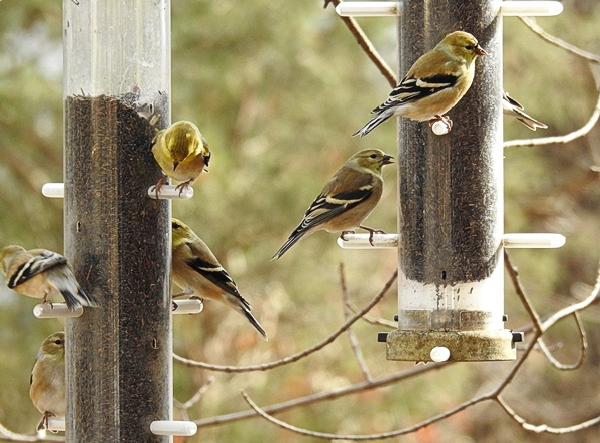 I have a cluster of four Aspects nyjer tube feeders over by themselves in the side yard that are goldfinch territory. Occasionally a House Finch or a Purple Finch will grab a feeder spot too and in the winter, some of the sparrows will hang around under the feeders to grab fallen seed, but most of the time it’s all for them. 3) To give small birds sure feeder access, I currently have three cage type feeders (two Woodlink feeders and a Nuttery Globe feeder) filled with sunflower hearts. They are clustered together on one dual shepherd’s hook pole in the back yard near the house. There is also a sunflower heart filled Squirrel Buster Plus feeder about ten feet away from this feeder that is currently surrounded by anti-House Sparrow wires. All of these feeders appeal to the same group of birds: American Goldfinches, House Finches, Purple Finches, White-Breasted Nuthatches, Red-Breasted Nuthatches, Carolina Wrens, Carolina Chickadees and Pine Warblers. The Eastern Bluebirds also seem to like the Squirrel Buster Plus feeder for sunflower hearts but they get along fine with these birds. Most of the time these feeders have finches of one type or the other on them, with the other birds popping in occasionally to grab a seed or two and then go off to eat or cache them. 4) Another twelve feet further out in the yard is another dual shepherd’s hook feeder. This one has three feeders: a Birds Choice hanging platform feeder, a small Birds Choice hanging hopper feeder and a Squirrel Buster Classic tube feeder with the perches removed. These feeders spend most of the time filled with safflower seed, so most of the time, this is the spot where you will find Northern Cardinals, House Finches, Purple Finches and Mourning Doves. If I swap out the safflower in the tube feeder for sunflower hearts, many of the other small birds that come to the cage feeders will visit this one too. Once or twice a day, I’ll toss a couple handfuls of peanuts into this platform feeder on top of the safflower, which makes it pretty lively for about twenty minutes. 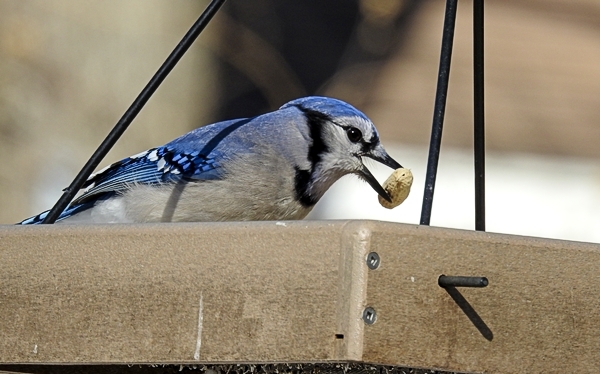 During this period, the more usual birds will back off while the Blue Jays, Red-Bellied Woodpeckers and the occasional Common Grackle or Tufted Titmouse will zoom in and out to get the peanuts until they are all gone. Because of the platform feeder, this cluster can also get popular with mixed spring flock birds like Common Grackles, European Starlings, Brown-Headed Cowbirds and Red-Winged Blackbirds. 5) Another seventeen feet even further out in the yard is another cluster of two feeders mounted on poles, one a Birds Choice covered platform feeder and one an old large metal hopper. These two feeders are often dominated by Mourning Doves, but it is also the favorite spot in the back yard for Northern Cardinals and House Finches like it too. Other birds like Tufted Titmouses, Carolina Wrens, Carolina Chickadees and (rarely) Rose-Breasted Grosbeaks will visit this feeder too. 6) Twenty-two feet off to one side, is a feeder all by itself, the Erva Mealworm Feeder. When I first tried to offer dried mealworms in their own feeder, a small Squirrel Buster Standard, I had them on the pole in the middle of the yard with the platform feeder and the Squirrel Buster Classic, but the starlings were so aggressive that they were constantly disturbing access to the other feeders on the pole. I had to move the feeder off to one side where it hung from a tree limb under an Erva baffle. That brought more peace to that cluster of feeders and was a good move. Now that I’ve switched to this Erva Mealworm Feeder, the starlings mostly leave the feeder alone (only occasionally trying it in apparent hope that THIS time they’ll be able to get in) so it doesn’t really need to be set aside, but it’s working okay there for now and I’m out of pole space at the moment anyway. 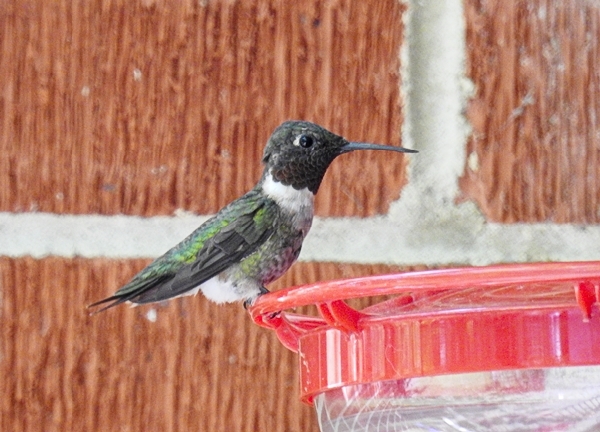 7) From mid-April to mid-fall, I also put up two hummingbird feeders. They each hang from the house about twenty to twenty-five feet apart in the back and fifteen to twenty feet from other feeders. Ruby-Throated hummingbirds can get territorial about feeders and chase other hummingbirds away. Separating the two feeders helps keep the peace. 8) Finally out in the front yard, there are two feeders each hanging from a tree limb under an Erva baffle, one a Squirrel Buster Plus tube feeder that is either filled with sunflower hearts or safflower and the other a huge metal mesh feeder filled with safflower. 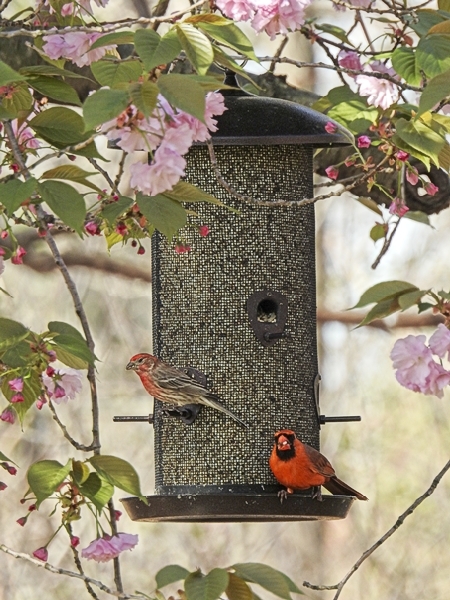 The mesh feeder is the front yard favorite of Northern Cardinals and House Finches. Mourning Doves are typically to be found eating dropped seed underneath it. The Squirrel Buster Plus’ customers depend on which seed I put in it and the time of year. Each of these feeders is far enough apart and also far enough away from the front yard suet feeder pole that activity on one feeder doesn’t tend to interfere with activity on the other. There are not as many feeders in the front yard as in the back, but having this second main feeder area lets birds move to the front or back when there is human or flock activity in the other area that interrupts their feeding. 9) I also have six birdbaths, two in the front yard and four in the back. Many birds will coexist peacefully at birdbaths but having a variety lets them spread out and pick a non-busy one if they like. Do you see the pattern here? 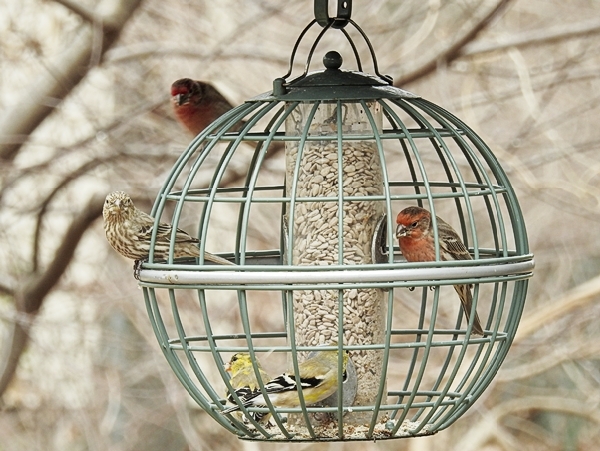 The feeders are clustered by type of food and types of birds that usually use the feeders. Yes, various birds will check out any of the feeders and that is fine. And sometimes, especially when the spring flocks descend on the feeders, the regulars have to back off from some of the feeders. But even then, there are some feeders (like the cage feeders, wired feeder and nyjer feeders) that the flocks leave alone so at least some of the regulars can still eat in peace even then. You may live in a different area than I do and get a different mix of birds at your feeder. You may have fewer feeders or a different mix of feeder types. You may have a larger or a smaller space to put feeders. So your arrangement of feeders is going to be different. 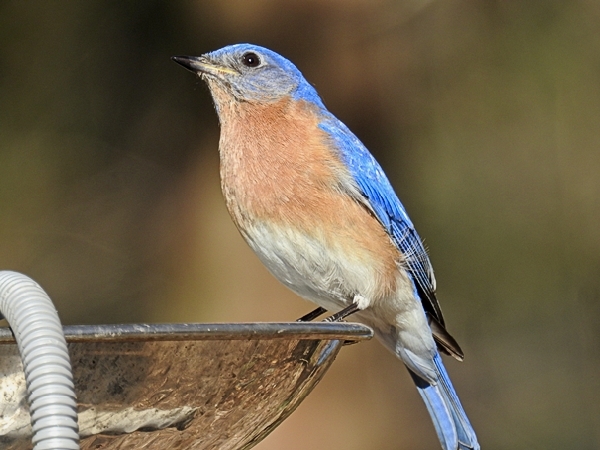 Watch the birds at your feeders and how they interact. If you see one species of bird routinely pushing out another that you enjoy seeing at your feeders, think about whether you can rearrange your feeders to let the less dominant birds have more feeder time.